Even if you’re just playing single notes on the harmonica with no special effects, tongue blocking has one advantage: It configures your mouth to promote a full, rich tone. Sure, you can get a good tone with puckering, but tongue blocking makes it almost automatic. 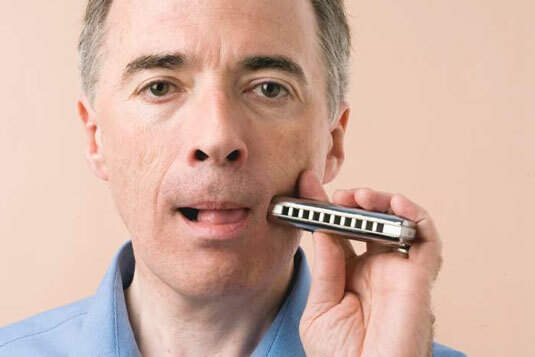 Place the harmonica between your lips so that the front of the harmonica touches the right and left corners of your lips, where your upper and lower lips meet. Touch the tip of your tongue to your bottom lip and press your tongue forward gently. Gently press the top of your tongue against the harp. When you do this, the top of your tongue will make a broad surface that glides against the harmonica without poking into the holes. Touch the left edge of your tongue against the left corner of your lips, leaving an opening between the right edge of your tongue and the right corner of your lips. This is where air passes through to the harmonica. Listen for air escaping and move the harp a little to the left or right to help align a single hole with your mouth opening. Try to make the opening between your tongue and the right corner of your lips small enough to isolate a single note but large enough so that air can flow freely and produce a clear, strong note.